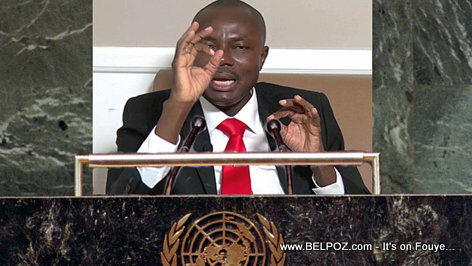 Read what Miami Herald journalist Jacqueline Charles said about Moise Jean Charles' visit to the United Nations. Apparently, the opposition leader went the UN "At his request." During recent visit to United Nations, Ex Senator Moise Jean Charles was received at working level at his request on 27th floor. He and his cortege greeted by 2 political affairs officers. Moise Jean Charles made two requests and several complaints. He was told to cease violent protests and seek peaceful dialogue. But... It was just a meeting. 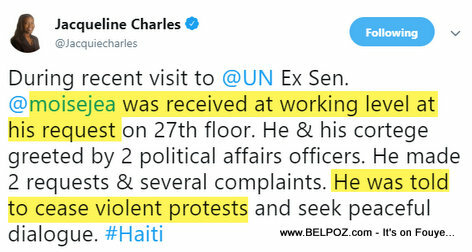 Moise Jean Charles at the UN ?That fellow has NO chance to be taken seriously by ANY foreign leader ..None ...It's sinple as that !...The "OTHERS"?